← California – size matters! By the time westward expansion brought settlers across the Mississippi River, states started to take on rather uninteresting shapes. Unimaginative shapes – – – like “rectangle.” As explained in an earlier post, the advent of railroads had removed the need to use rivers to define the borders of states, so it became much easier to draw boxy shapes and attempt to make states roughly the same size. 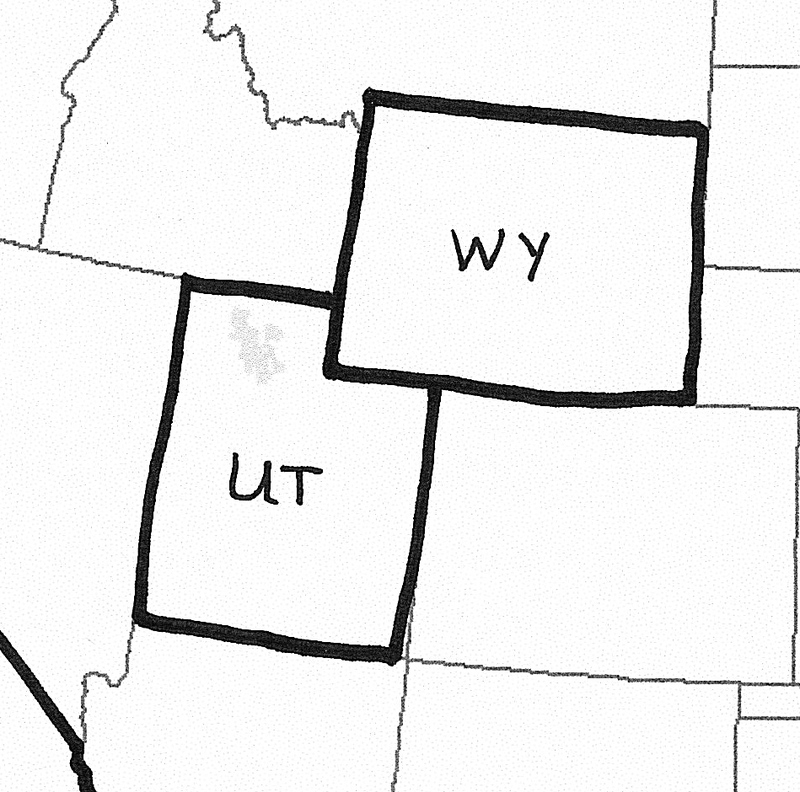 But Utah and Wyoming were two rectangular shapes that overlapped each other. One was going to have to give up some land. How did they decide to leave Wyoming as a complete rectangle and cut a notch in Utah? Part of the reason was political. Congress had already been dealing with the Mormon influence that had flooded Utah and the region (see my post in July titled “States that Disappeared” for more information) and by this time were not feeling particularly inclined to grant that fledgling territory any more land than it had to. The notched area was rich with many natural resources and Congress worried about giving too much power to a religious group in the cultivation of those riches. But in the end the decision was made for more practical reasons. Just to the south and west of the notch, Utah is home to the rather ample Uinta Mountains. The ability to govern a chunk of land separated from everything else in the state by a wall of mountains was a serious difficulty in those times. But from the Wyoming side, no such impediment existed. It made pragmatic sense to grant that notch of land to Wyoming based on the geographic ease of maintaining law enforcement and state governance in that area. Wyoming became a state in 1890 and Utah followed in 1896. This entry was posted in Uncategorized and tagged Mormons, Uinta Mountains, Utah, Wyoming. Bookmark the permalink. I’m just loving learning the shape of things. Thank you! Thanks Debra. I’m still fascinated by everything I’m finding in my research. And it intrigues me that most of the decisions Congress was making about this stuff was sight unseen. They were on the other side of the country and relying on maps and surveying data to make their decisions. Previous to that the King of England was making decisions from across the ocean. Weird. What is the name of the State that never made it’s count or it’s acknowledgement that it excist right after the civil war. I believe it is the right corner bottom of Missorri and top corner of Arkansas? Could you please confirm this for me. I appreicate your time. It was to make the 52 state? OR– Is that the un-named state from the civil war at the corner top of Wyoming & Utah that you are talking about? I heard it on a Discovery Channel and the topic just came up in a conversation; so here I am asking. Again, thank you. Jodi – there were three short-lived states that I’m aware of. I’ve written about two of them so far: The State of Franklin that was in the northeast corner of what is now Tennessee; I also wrote about Deseret, the Mormon state that covered a big swath of the west (there is a map on my blog post in the archives here); and there was also a state called Jefferson, which I haven’t written about yet, but was located pretty much in the space that is now Colorado. Any of those can be googled to see if they’re the ones you are thinking of.